This stunning new crossover truck concept debuted during this week’s Detroit Auto Show and ranked #8 in the Top 10 vehicles of the auto show. This wasn’t the first time a crossover made a splash in the auto industry. Remember the Chevy El Camino? This popular vehicle was considered an innovative crossover during its hey day from the late 1950s to 1980s. 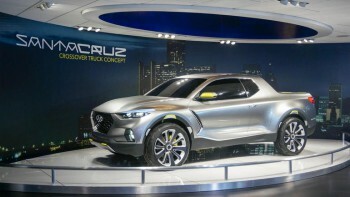 The El Camino has definitely grown up, as evidenced by this futuristic Hyundai Santa Cruz. What do you think? Check out this video for the lowdown on this innovative concept vehicle.